There are only about 12 generations in between them. 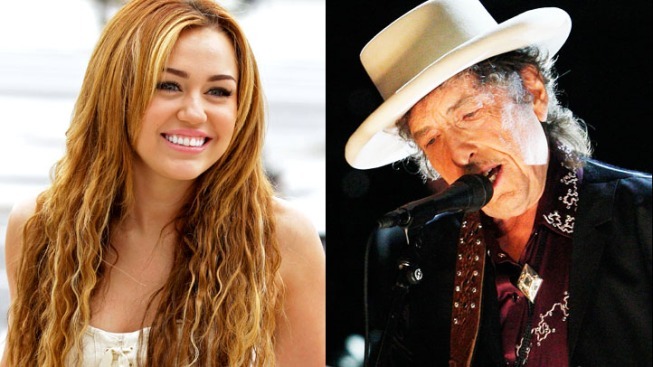 A lot of artists have covered the poignant songs of legendary troubador Bob Dyla, and the latest is .... Miley Cyrus? The "Hannah Montana" star is one of several singers who have volunteered to cover of a Dylan song for an upcoming album, "Chimes of Freedom: Songs of Bob Dylan Honoring 50 Years of Amnesty International." Proceeds will go to the human rights organization. It's not clear which Dylan song Cyrus will cover. Other artists covering the bard for charity include Adele, who already had a smash hit with Dylan's "Make You Feel My Love," and Ke$ha, who will sing "Don't Think Twice, It's Alright. The two have been active in supporting Amnesty International's "life saving work to protect human rights around the world...and to inspire [fans] to stand up for justice, freedom, and human rights," says a rep for the group. "When you think of me, you wouldn't think of Bob Dylan," said Ke$ha. "My music is more about the going crazy than politics. But he's a huge influence - he writes his own music and means what he says." The charity album isn't due to be released until early next year and the specific tracks that will be covered have yet to be announced. Cyrus has covered songs by music idols from older generations, including Nirvana and Poison.